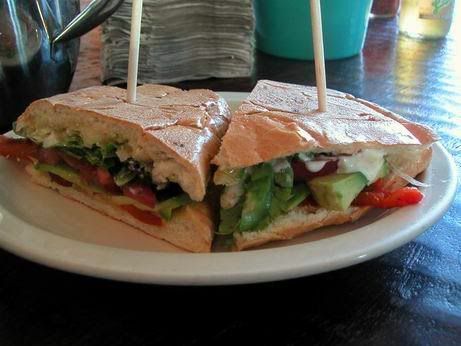 Strangely, my new favorite sandwich is…Puerto Rican. In downtown San Rafael, just a half hour from San Francisco, there is an unmistakably bright green building on the corner of 3rd and Lincoln. It’s practically become a new landmark in town. There is even a snarky letter posted behind glass near the front door, demanding the establishment change it’s outlandish color, because the person is so offended by such an eyesore. I think it’s fun. Would I paint my house that color? No. Is it totally cheery and whimsical? You bet! With the exterior wall color, you already feel transported to another country. But when you walk into Sol Food, you are immediately thrust into some tropical land…but not in a cheesy way. There are ceiling fans, live plants, and funky colors all over. 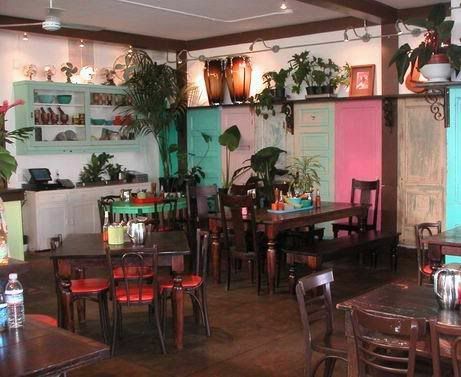 The seating is somewhat communal, since it’s always packed, and a green plantain acts as a decorative paper weight on the stack of napkins at each table. I must say that I have a special place in my heart for french fries and that special place also extends to tostones (fried salted plantains). Sol Food has awesome tostones. They serve them up hot, and garlicky in all their fried goodness. “In Central and Western Africa, plantains are cooked and mashed to make Fufu and similar Fufu-like staples. In Ghana, plantains are mixed with spices and fried in hot oil to make Kelewele. In Eastern Africa, plantains are fermented to make a kind of beer or wine (see Pombe, Tembo, and MÃ¡wÃ¡). 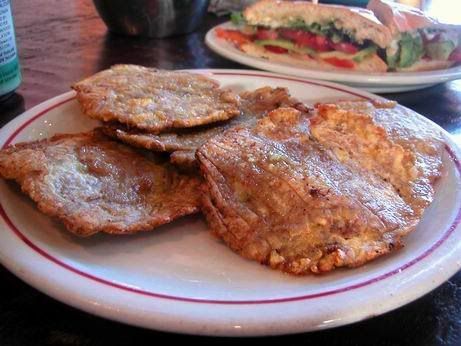 I enjoy bananas and plantains all sorts of ways, but I especially love Sol Food’s Tostones con Mojo (green plantain fried, smashed and fried again, served with fresh garlic and olive oil). I always add a little salt at the table, and am in starchy fried heaven. We’ve made them at home few times, so I’ll have to post our “recipe” (really more of a technique) soon. So…you are wondering about the sandwich I mentioned in the first paragraph. It’s their Veggie Deluxe: (tangy/sweet) roasted red peppers, sauteed onions, organic greens, tomato, (always the perfect ripeness) avocado, jack cheese and (garlicky, tart, bright, sloppy) cilantro-lime mayonnaise on french bread. The french bread is not the highest quality, but they flat press their sandwiches, like panini, so you almost don’t notice. It was warm, and crunchy, and incredibly flavorful. The cilantro-lime mayo makes the sandwich. Without that, it would be like most other vegetarian sandwiches I’ve had, but the special mayo gives it that dripping-down-your-fingers, feel-like-a-kid extra kick. An experience that’s not only memorable, but one I want to repeat…soon. 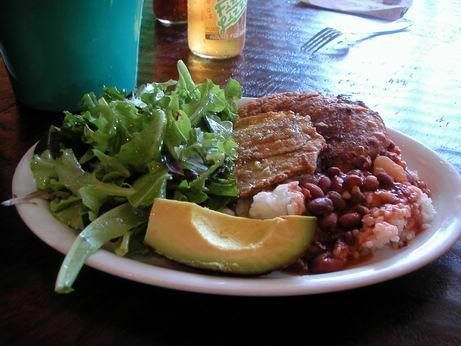 Their other veg-friendly dish is their Combinacion Vegetariano: Pink beans stewed with herbs and Spanish olives, served with rice, organic salad, fresh avocado and 2 pieces of tostones or maduros (sweet fried yellow plantain). It also quite good, but I think I’m hooked on the sandwich. 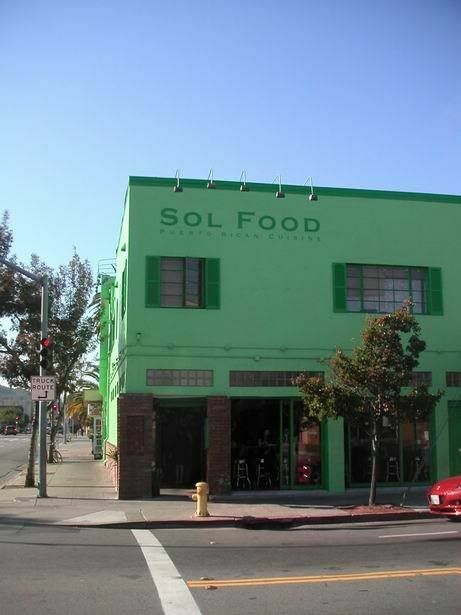 Sol Food’s original location (more of a stand than a restaurant) was so successful and tiny, they had to open a second location, which seems to be working quite well for them. It’s great too, because if you get off the freeway at the Central San Rafael exit, it’s just a few blocks away, and sticks out with that distinctive green exterior. Cool thing is, they deliver as well. They also have long hours, so you can get your fix, practically ’round the clock. Mon-Fri 6:30am-10pm, Sat & Sun 8am-10pm, on Fri and Sat nights they’re open til 2am. Sounds divine. Will they deliver to Australia, you think? that is one drool worthy sandwich, and that is one perky building. lol. that avocado in the sandwich makes me want to run out NOW and buy some for the week. or maybe find a place that sells jibaritos around my house! Gigi – Great to see you. The avocado at Sol Food is always the perfect ripeness and creaminess, without any of those weird fibers. They know how to pick ’em. I don’t know what jibaritos are. Something new for me to look up. thanks for the info but next time make sure that the names of the foods are more visible.